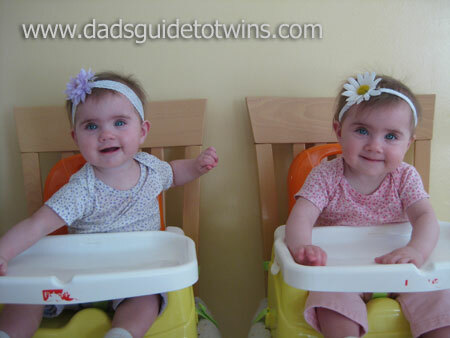 When your twins are ready to start eating solid foods, you’ll need somewhere for them to sit. Traditionally, this means buying high chairs. Buy booster seats that fit on your normal kitchen chairs instead of buying high chairs. Eventually your kids will need booster seats anyway. So if you skip the high chairs, you save money and can use what you buy for a longer period of time. We purchased some Fisher-Price Healthy Care Booster Seats and have loved them. We covered our existing kitchen chairs with a towel and then put the booster seat on top. The seat’s tray can easily be washed by hand or stuck in the dishwasher. The hard plastic seat can easily be wiped down. When too much of a mess built up on the towel under the chair, we simply swapped it out, threw it in the wash, and put a new towel in place. Another advantage of buying booster chairs instead of high chairs is that you’ll save money. Saving several hundred dollars for baby seating is totally worth it. 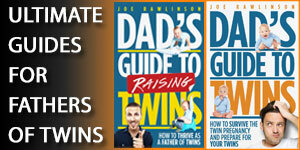 Here are the booster seats that worked great for our family. 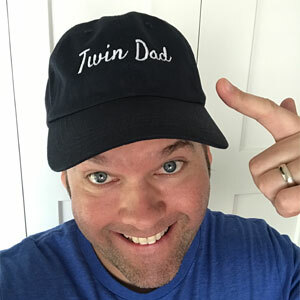 I talk more about feeding solids to your twins in Chapter Four of my book, the Dad’s Guide to Raising Twins: How to Thrive as a Father of Twins. My partner and I are very lucky to have 5 months old twin boys, I am just wondering about the importance of teaching them how and when to share, what items should I only get one of for them to share and what sort of things they need to develop their own individuallity? 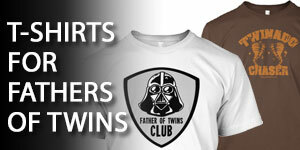 @Ricardo – It is important that you help your boys develop their individual personalities. That said, it is OK to share many things like toys, clothes, movies, a bedroom, etc. However, they will also want something that is just their own thing. For example, our girls each have their own blankets that they love. They also have a few other toys that they claim belong to one or the other. @Sarya – I admire your creativity. We skipped the high chairs because we knew they would outgrow them. You are just leap frogging ahead of even the booster seats. As your kids get bigger, they won’t fit in their car seats so you’ll need to get creative again to make it work. I have one year old twin boys, what would you recommend for feeding. I used to feed my boss in their walkers but since they are walking, they throw fits to get out. And when they throw fits they don’t eat.. So it’s hard trying to figure out ways to get them to sit down and eat. We are on a tight budget, and it send expensive to get TWO high chairs. 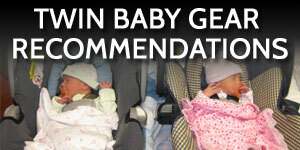 @Aileen – we found the booster seats a lot more affordable than full high chairs. So as I mentioned above, you might want to try that first. Also consider how you reinforce behavior. Positively reinforce when one of your twins is doing what you’d like. We found that this helps keep them in line and the other twin often wants to do good to get the same praise. Does anyone have any experience with the Stokke Tripp Trapp? They are highchairs that “grow” with the children. Besides that, they made of wood. I am not as keen on keeping the environment nice as I maybe should be, but for furniture I think sustainable is the way to go. @Jan – you shouldn’t need a high chair after a few years so this might be too much. If you get a hard plastic booster seat, they can be recycled later if you don’t just donate it to a thrift store or another family. Stokke TTs were one of my must-have splurge items! I LOVE THEM. I used the baby set and cushions at first (~5 months) and then ditched the cushions (but still use the baby set) once they started feeding themselves (8-9 months) because they get food everywhere and it’s easier to wipe down the wood. I LOVE that they are always able to be at table height. Once they can eat with a plate and utensils, we will ditch the tray and all eat at the table. And if we decide not to use the chairs in our kitchen or dining room, they’ll become their desk chairs. I didn’t end up using the twin Z to breastfeed much, but enjoy it as a “baby couch” – it was a soft spot to put them down when they were tiny, and have them sit when they were a little bigger, and they still crash there to feed themselves their bottles now (I also use it to frame our monthly photos since you can see how much bigger they are getting relative to the pillow as they grow). 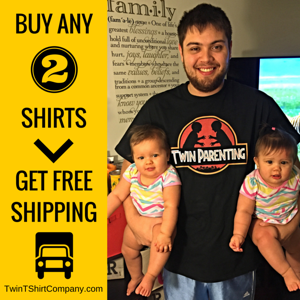 Feel free to bug me about any other product Qs if you want since I’m still in the thick of it (also b/g twins). @Rebecca – thanks for sharing your experience with these products!